"The Susanna Jayne headstone was carved by Henry Christian Geyer. The top part, known as the crown or tympanum, has an unusual shape, although it is obscured by the protective granite now encasing the original stone." Whose Form was harmony, whose soul was Love. What were her Graces? all Divinity Fair. As spotless Good, and lovely as the Rest. "The Jayne stone features an unusual abundance of symbols. A skeleton, representing Death, is the central figure. It wears a crown of laurels, indicative of victory. In its hands are celestial objects: the moon in one hand and the sun in the other. Behind Death is the scythe it uses to reap its harvest. Encircling Death is a snake, with its tail in its mouth, possibly indicating the neverending nature of eternity. In the upper two corners are winged cherubs, or angels of heaven. In the lower corners are bats of the underworld. 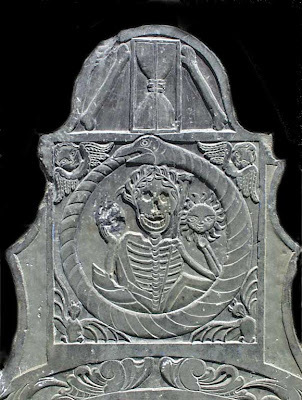 The upper panel has an hourglass flanked by bones: Death moves in when time runs out." Sensational reference. The whole site is from imagery to wonderfully wierd ligatures etc.